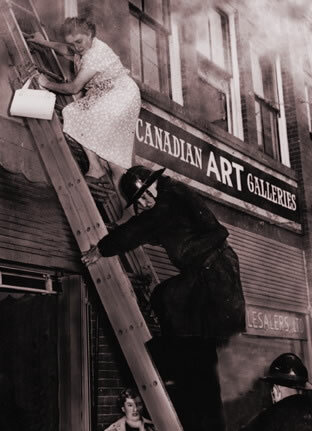 Founded in 1945 by painter John Davenall Turner and his wife Grace, Canadian Art Galleries opened as a commercial art gallery in downtown Calgary, Alberta. CAG supported and represented Albertan, Western Canadian and artists from other parts of Canada during 50+ years of continual operation and held the first exhibitions of the Group of Seven in Western Canada. In 1993 Doug MacLean became the sole owner and in 1999 changed the name to Canadian Art Gallery. After graduating from the Ontario College of Art in 1975, Doug MacLean's gallery training began in Toronto with positions at the Marlborough Godard Gallery, the Mira Godard Gallery, and Gallery Moos Ltd. He later worked with director and author Joan Murray as assistant curator at the Robert McLaughlin Gallery, Oshawa. Doug moved to Calgary in 1979 to become the Assistant Director for Walter Moos' Gallery Moos Ltd. In 1983 he assumed the position of Acting Director for the Mira Godard Gallery. Unfortunately, the Calgary economy, hard hit by the economic recession of the 80's, forced the closure of both galleries. In 1983, Doug became a partner in Canadian Art Galleries and in 1993, the sole owner and director. Doug has been a member of the Art Dealers' Association of Canada for 15 years and was a board member for over 10 years during the 1980's and 90's. In 1999 Doug rejoined the ADAC board and continues to serve as Membership Committee Chairman. Archived promotional material for the years 1995 to 1999.